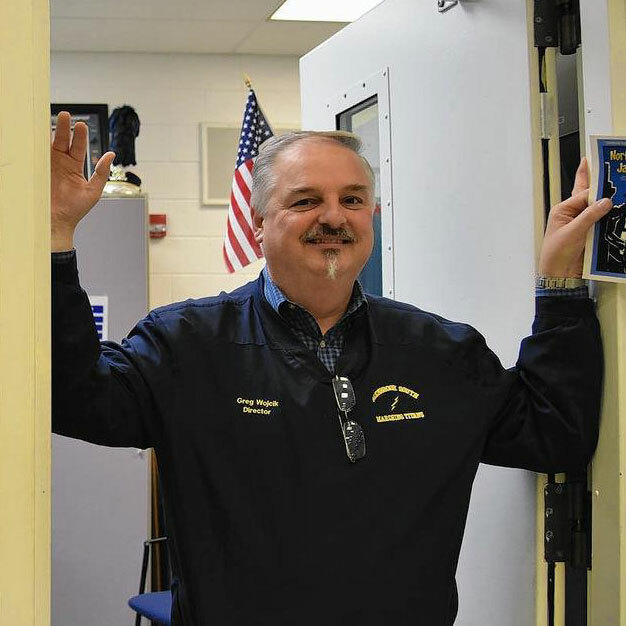 Greg Wojcik has been teaching at Glenbrook South High School for over thirty-seven years. Hailing from a musical family, he began his performance career at Lane Tech High School in Chicago, IL under the direction of Mr. Maurice Golden. Over four years, Mr. Golden was inspirational in leading Greg toward music as a profession. At age fourteen, his formal training on the trombone began under the influential guidance of Mr. Richard Schmitt of the Chicago Symphony Orchestra. It was Dr. Edgar Gangware of Northeastern Illinois University who introduced Greg to the world of music education. Throughout his professional career, Greg has always held a deep appreciation of these fine music educators. Greg’s professional career started at age sixteen when he joined the Chicago Federation of Musicians. As a professional, he performed at countless venues throughout the Midwest. He attended Northeastern Illinois University where he earned his Bachelor of Arts in Secondary Music Education. It was during his student teaching at Glenbrook South High School where he found his passion. Upon completing his degree, Greg was hired as the new Assistant Director of Bands. While being the assistant director at GBS, Greg was also teaching band and orchestra at Sunset Ridge Junior High. At the high school, Mr. Peter Pappas (the director of bands) and Greg worked side by side for fourteen years. Pete was Greg’s friend and mentor and in 1994, upon his retirement, Greg was appointed as director of bands at GBS. Under Greg’s direction, the band has traveled throughout the United States and abroad, consistently receiving superior ratings. Over his career, Greg has been recognized by many organizations for his contributions to education. In 2000, Greg had the honor of being chosen as the Distinguished Teacher of the Year at Glenbrook South High School. Greg was nominated by his peers and was named the 2007 Mr. Holland’s Opus Recipient. In 2008, the GRAMMY Foundation recognized the Glenbrook South High School Music Department as the National GRAMMY Signature School. Greg was presented with the Illinois Music Educators Association’s Mary Hoffman Award in 2010. The Mary Hoffman Award is an annual award that recognizes teaching excellence in music education for the State of Illinois. Greg has also been nominated three times for the Golden Apple Teacher Award. He was selected as a Teacher of Distinction by the Golden Apple Foundation in 2013. Recently, the Northern Suburban Special Education District recognized Greg with their Best Practices Award for his work with special needs students. Greg’s professional affiliations include the Illinois Music Education Association, Music Educators National Conference, Phi Beta Mu, The National Band Association, National Education Association, and the Chicago Federation of Musicians. Greg and the Glenbrook South Bands host an annual jazz festival known throughout the region – the Northshore Jazz Fest. Over 80 band from the Midwest participate in this event. Greg has worked as a mentor or cooperating teacher to over 45 future music educators. Though his first love is teaching, he still performs throughout the city at a variety of venues. Greg began performing with the Glenview Concert Band in 2007. Upon the passing of his close friend and mentor, Ken Bartosz, Greg took over the helm of this fine community band. The band performs throughout the community and suburban area bringing live music to a new generation of Illinois residents. In 2012, Greg’s son, Aaron was hired as the assistant band director at Glenbrook South High School. He is excited to see what the next generation of educators has to offer the institution that has treated him so well. Greg guest conducts and adjudicates festivals and clinics throughout the Midwest. Greg’s energy and passion for music and teaching has touched thousands of lives.